One man was killed and a woman was injured in a pair of shootings in northeast Miami-Dade late Sunday and early Monday. 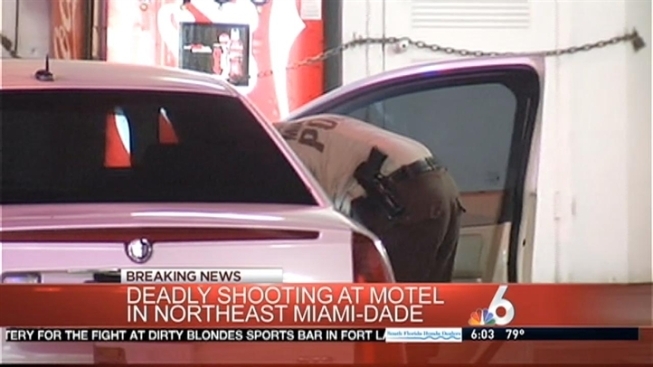 The first shooting happened around 11:30 p.m. Sunday in the parking lot of the Sun and Surf Motel at 100 Northeast 111th Street and Biscayne Boulevard. Miami-Dade Police said a black male was sitting in his car when he was approached by a gunman who shot him and fled the scene. The victim, who wasn't identified, was pronounced dead at the scene. A woman who was staying in the motel said she heard a gunshot and looked out the window and saw the body. "I just saw the door open and I saw some feet hanging out too," said the woman, who didn't want to be identified. The second shooting happened just over an hour later about 10 blocks north on Biscayne Boulevard, when a woman was shot in the face inside a 24-hour Denny's restaurant. North Miami Police spokesman Maj. Neal Cuevas said a man who knows the woman shot her in the face. She was airlifted to Jackson Memorial Hospital's Ryder Trauma Center in stable condition. Cuevas said the Denny's shooting isn't related to the earlier shooting. Police said they have no motives behind the shootings. Both shootings are being investigated and anyone with information is asked to call Miami-Dade Crime Stoppers at 305-471-TIPS.